When Gov. Cuomo in January announced his $10 billion proposal to rebuild and revitalize much of John F. Kennedy International Airport, comparatively little attention was paid to his desire to lift if not eliminate a cap on flight slots into and out of JFK. The governor said it is necessary to maximize JFK’s potential. 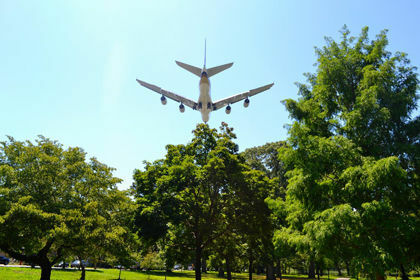 But with residents around the airport saying they already are dealing with enough noise from the existing number of planes, some elected officials in the borough are reviving calls to mandate quieter jet engine technology. In an interview last week with the Chronicle’s editorial board, state Sen. James Sanders Jr. (D-South Ozone Park) said he first heard of such proposals years before, even prior to the 9/11 attacks in 2001. There is a movement afoot in the Queens delegation to Congress to do just that, and more. U.S. Rep. Joe Crowley (D-Queens, Bronx) has LaGuardia Airport in his district, and long has called on Washington to either encourage or push quieter jet engine technology. In an email to the Chronicle, Crowley does not dispute the importance of the airports to the region. But he also said he will reintroduce his Silent Skies bill, which would phase out older, noisier jet engines in the country’s passenger jet fleet. A spokesman for U.S. Rep. Grace Meng (D-Flushing) said Wednesday that the congresswoman will be reintroducing her Quiet Communities Act. The bill, if it passes, would transfer responsibility for monitoring and enforcing airport noise standards from the Federal Aviation Administration to the Environmental Protection Agency; the EPA had jurisdiction over noise standards until the Ronald Reagan administration in the 1980s. U.S. Rep. Gregory Meeks (D-Queens, Nassau), whose district includes JFK, told the Chronicle last month that he is a co-sponsor of Meng’s bill. He said any project to modernize JFK — which he agrees is necessary — must include provisions to deal with the noise associated with any increase in traffic. Barbara Brown, president of the Eastern Queens Alliance, an umbrella of numerous civic groups in Southeast Queens, also said residents’ health and quality of life cannot be sacrificed in the process of upgrading JFK.